Afghan Cycles is a look how some women in Afghanistan are taking to the streets in an expression of freedom. 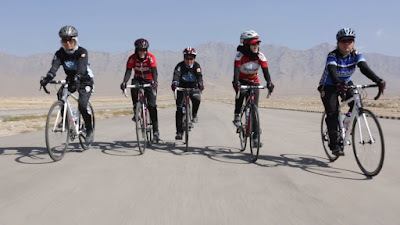 Focusing on a group of women who ride together and hope to compete around the world. We watch as they go through their lives including dealing with the displeasure that some traditionalists throw their way. Showing Afghan society in ways we have not seen before Afghan Bicycles is a bittersweet gem. We know it’s going to be not be all sunny days at the outset when in present day Nice France we meet one of the women as she reflects on what has transpired. The film then flashes back four years to show us all the women together. What makes this film so special is that it is not just another film about Afghanistan full of soldiers, radicals and destruction. Here is life beyond the typical media portrayal. While the film is the battle between fundamentalism and modern thought the film opens everything up to show us life lived. We see life in the country as it is truly lived. There are bright colors and laughter. We see points of view that are not just one thing or another. As a former bicycle enthusiast this film made me smile. The joy and freedom the women experience while riding is one that is not unfamiliar to me. I was delighted at wachingthem ride. I was also delighted at seeing the country without guns everywhere. This is a super film. I don’t know what else to say beyond that except buy a ticket for when it plays at the Brooklyn Film Festival on June 7 and 8. For more information and tickets go here.